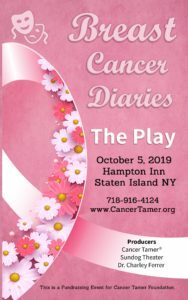 I’m thrilled and excited to bring you some updates about our upcoming Play, Breast Cancer Diaries premiering October 5, 2019 at the Hampton Inn on Staten Island. Casting Call: we are hosting a Casting Call, Saturday April 6 from 11:00 a.m. to 2:00 p.m. at the Unitarian Church on 60 Clinton Ave, Staten Island. This Casting Call is open to EVERYONE; women and men who’ve been diagnosed or affected by breast cancer. You do not have to be an actress/actor to participate. 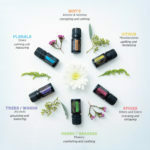 We invite loved ones, family members, kids, friends, medical professionals and strangers who would like to share an inspirational message to attend. Messages are limited to 60-seconds. Our Faces of Breast Cancer video is open to women and men diagnosed with breast cancer. Please arrive “camera ready” as we do not provide hair or make-up services. The SI 44 Bus stops on Lafayette just three blocks up the street. For those unable to attend in person, you may submit your picture and Messages of Hope video via weTransfer.com. For complete details, visit our Casting Call webpage. As you know, producing a Play takes a lot of time, effort, and is very expensive. If you would like to volunteer or become a Sponsors, please email us for further information. You can also make a tax-deductible DONATION through our website; see button at the top of the page on the right hand-side. Every little bit helps. Many thanks to our current Sponsors: Staten Island Arts, BCB Bank, and Passionate Woman.